I want to discuss the hydro-electricity option but not as a stand-alone alternative but pumped-storage hydro schemes as a complement to wind power. This begins with a statement of the obvious as far as Scottish electrical power-generation engineers and scientists are concerned I expect but I am making this introductory statement anyway, not for the benefit of our scientists or engineers but to inform the political debate about the potential of the Scottish economy "after the North Sea oil runs out" because political debate involves mostly non-scientists and non-engineers who need to have such things explained to them. The technique is currently the most cost-effective means of storing large amounts of electrical energy on an operating basis, but capital costs and the presence of appropriate geography are critical decision factors. Video which illustrates the principle of using wind turbines and pumped storage hydro dam schemes together. Part of the red contour line at 775 metres elevation, where the red line surrounds a blue shaded area, blue representing water, shows the outline of my larger reservoir of about 2 square kilometres surface-area and the thicker brown line shows the position of my proposed dam which would stand 317 metres tall which would be one of the tallest man-made dams in the world, 1475 metres long and about 72 million cubic metres in volume. Since an excavated reservoir bed is not, that I can see, part of the SSE plan, except as they need rock for their dam, I will provide some more information about my vision for that now. Excavating around 138 million cubic metres of rock increases the volume of the reservoir so created to about 400 million cubic metres, achieving a theoretical energy storage capacity of more than 600 GigaWatt-Hours and it ought to be possible to excavate enough rock to achieve a practical 600GW.Hrs electrical energy supplied. Accordingly, I envision it would be appropriate and useful to install the required turbine-pumps to supply up to 12 GigaWatts of electrical power to the grid for up to 50 hours before the energy store would be exhausted. A vertical reservoir bed perimeter wall would be ideal to maximise reservoir volume wherever the geology provides a strong stone which can maintain a vertical wall face without collapse, (a stone as strong as solid granite would be nice though Coire Glas looks to be mostly made of a rock called "psammite"). Ideally this would allow about 138 million cubic metres to be excavated to flatten the reservoir bed. 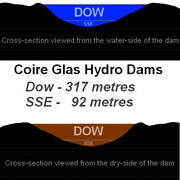 If the GDD turns out ot be 83 metres then the dam will be 400 metres tall. The high pressure of water which is deeper than 100 metres has the potential to induce seismic activity or earthquakes in susceptible rock in which a new reservoir has been constructed. Wikipedia: Induced seismicity - Causes - Reservoirs. The mass of water in a reservoir alters the pressure in the rock below and through fissures in the rocks, lubricates the fault, which can trigger earthquakes. Unfortunately, understanding of reservoir induced seismic activity is very limited. However, it has been noted that seismicity appears to occur on dams with heights larger than 100 meters. The extra water pressure created by vast reservoirs is the most accepted explanation for the seismic activity. Hopefully, reservoir induced seismicity was an issue considered by the SSE when selecting Coire Glas for their hydro dam project. I am speculating that this issue may be why the SSE have limited their dam to a height and their reservoir to a depth of 92 metres? I would note however that the pressure in the head race tunnels which supply water from the reservoir to the turbines would be proportional to their depth below the surface of the reservoir and this could be as much as 500 metres deep, so there would seem to be some potential for water to penetrate the bed rock from the high pressure water tunnels and induce seismic activity even in the SSE case. This is an issue which ought to have been addressed in the many previous pumped-storage hydro scheme projects, most of which seem to have a difference in head of more than 100 metres. Given that "understanding ... is very limited" according to Wikipedia, though, I do wonder if the reservoir induced seismicity issue has not always been properly addressed in all previous dam and reservoir construction schemes where the great depth of water and susceptible geology ought to make it a relevant concern? I am proposing measures to counter the reservoir induced seismicity effect in the case that the geology of Coire Glas is susceptible to it and in the general case. I propose the construction of a large reservoir surface drain to cover the whole reservoir bed and the reservoir sides too to try to stop the penetration of water under high pressure into fractures in the bedrock and so thereby stop this high pressure water from widening and extending bedrock fractures. To illustrate my "reservoir bed drain" concept, I have drawn a diagram comparing the usual no drain on the left, with my proposed reservoir bed drain and dam drain pipes on the right. So my idea is that the top layer of the bed drain is as impermeable as practical, using perhaps a layer of reinforced asphalt concrete. In engineering practice I believe that impermeable reservoir bed layers have used clay or clay with asphalt or even rubberised asphalt mixed with sand. My basic idea is to construct an impermeable layer and to use whatever material is best for that. Then working downwards, the permeable bed drain layers are increasingly bigger loose particles, with sand at the 2nd top then beneath that grit, then gravel, then small stones and finally below all those a layer of large stones. The higher layers support the top impermeable layer which is under high pressure from the reservoir water and the lower permeable layers provide many small channels for any (hopefully tiny amounts of) water which forces its way through the supposedly impermeable top layer to drain down the slope of the reservoir bed to the base of the dam and then out under the dam through drain-pipes built into the base of the dam. The bottom layer of the bed drain is another impermeable layer to try to make doubly sure that the relatively low pressure water that gets into the bed drain will find its way out through the dam drain pipes by following the course of the drain. These kinds of layers of different sized loose particles have previously been used to make simple narrow drains and impermeable layers have been added to reservoir beds before now but whether professional dam engineers have ever covered the entire reservoir bed and sides with one large drain I don't know. If not, this could be named the "Dow drain" solution to reservoir induced seismicity! Why not add a simple impermeable layer to the reservoir bed? I think the additional complexity and expense of a bed drain (and drains for the sides too) is better than simply adding an impermeable layer. To construct Coire Glas/Dow/600GW.Hrs/12GW may cost of the order of around �20 billion, but that would be my order of magnitude educated guess more than a professional cost estimate. In other words, I'm only really confident at this early "vision" stage that the cost would be closer to �20 billion than it would be to �2 billion or to �200 billion but I'm not claiming to be able to quote an accurate cost estimate at this stage. For example, the cost of excavating 400 million tonnes of rock from the reservoir bed to increase the capacity of the reservoir to hold water (and energy) in my version won't be in proportion to the SSE costs for excavating their reservoir bed because, as far as I know, they don't plan to excavate their reservoir bed, except for rock for the dam. If indeed the cost of my scheme is somewhere around �20 billion it is likely to cost far more than the SSE or any electrical power supply company looking to their annual profits for the next few years could possibly afford. Something like �20 billion I expect could only be found as a national public infrastructure project, spending government money, like the building of a large bridge or motorway would be. A �20 billion government project would require Treasury approval, at least while Scotland is ruled as part of the UK. I have suggested funding my much larger hydro dam scheme by re-allocating of some of the Bank of England's "Quantitative Easing" funds which amount to some �300 billion of new money printed with not much to show for it. Welcome to PowerSwitch, Peter. Your first two posts, this and on wind power, have certainly boosted the information per post average of the forum. Your first two posts, this and on wind power, have certainly boosted the information per post average of the forum. Well I am sorry if I am disappointing you with this information-free post which is bringing the information-per-post average back down again. Such information-rich posts are not typical for me. Those two posts represent about 6 weeks of thinking, researching, composing and posting multiple smaller posts elsewhere, getting replies, debating, re-thinking and generally going through many emotional and intellectual crises known to man, yet somehow managing not to damage either myself nor my PC in the process. Well I am sorry if I am disappointing you with this information on xtrasize free post which is bringing the information-per-post average back down again. Such information-rich posts are not typical for me. Lol, I agree with Biff, this is one of the best posts on this site. What do you think about this subject these days Peter? Well four and half years later I am disappointed, but of course not surprised, that they haven't built anything like my super-sized 600GWh version of the SSE's modest 30GWh plan for a pumped-storage hydro scheme at Coire Glas. What I didn't predict was that by now there would still have been no decision to invest in the construction of any large new pumped-storage hydro scheme anywhere in Britain. World�s biggest-ever pumped-storage hydro-scheme, for Scotland? Then there was the poor decision to close Longannet coal-fired power station instead of converting it to burn biomass, leaving Scotland having to import power from England at times of low wind, an embarrassing state of affairs for an energy resource rich country like Scotland. What I think is that if there are any power cuts caused by UK government energy policy incoherence and mismanagement then there will be hell to pay.